“Isn’t this … Bircher Müsli? !” – That was what I thought when I saw a recipe for this ‘totally new’ breakfast trend called ‘Overnight Oats’ for the first time… and, yes, it basically IS Bircher Müsli. So, this new invention is not so new at all and actually more of a rediscovery of what the Swiss physician and nutritionist Maximilian Oskar Bircher-Brenner developed in 1902 as Apfeldiätspeise – as a dietary meal based on apples (actually it was ment as dinner) for the patients of his sanatorium “Lebendige Kraft” (vital power). His dietary philosophy which he understood as medical treatment against human degeneration was based on whole foods (not so unknown theses days) which contained in his eyes more solar energy and was therefor of higher value than processed food. 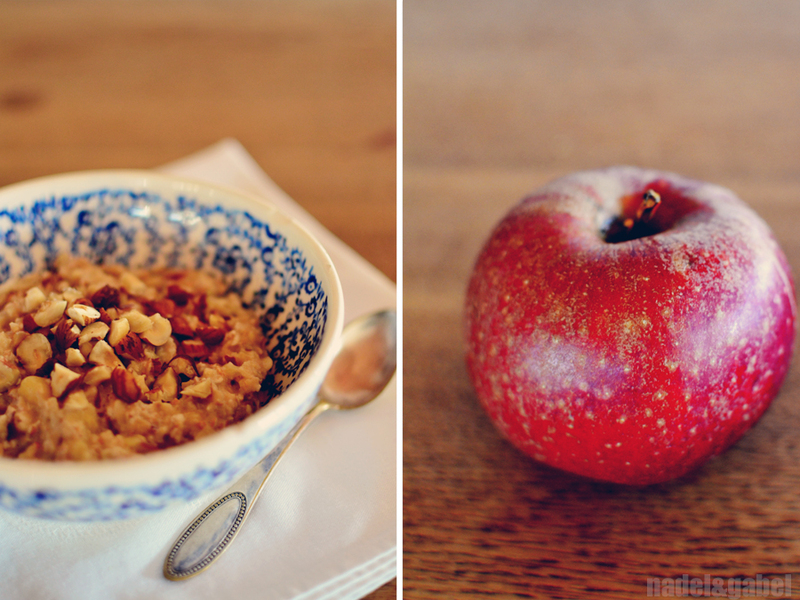 While the term Müsli which comes from the swiss German word “mues” (mush) already refers to the consistency of a müsli which comes from soaking oats overnight, the name “Apfeldiätspeise” indicates that the key of the dish was actually the apple and not the grains. By the way: Another part of Bircher-Brenners therapy concept that the sanatorium followed was a rigid schedule of various excercises. Thomas Manns famous novel “Zauberberg” was inspired by his stay at Bircher-Brenner’s Zürich sanatorium which felt for him like a “hygienic jail”. The master of Bircher Müsli in my view is my friend Ulrike. She has brought the recipe to perfection – no wonder if you make it on a regular basis for your little family. So it was her of course that I turned to for her kitchen secrets. While she keeps close to the original, she makes some small changes that make the difference: First of all she is owner of a flour mill and uses for her müsli fresh homemade steel-cut oats… I don’t have a flour mill, so I sticked with simple rolled oats. Besides the fact that she adds not only apples but also some banana to the recipe, the two simple – but important – supplements are: lemon zest and cinnamon. Just amazing! Apart from that this basic recipe is open for all sorts of variations: different nuts, addition of seeds, seasonal fruits or berries, variation of spices. 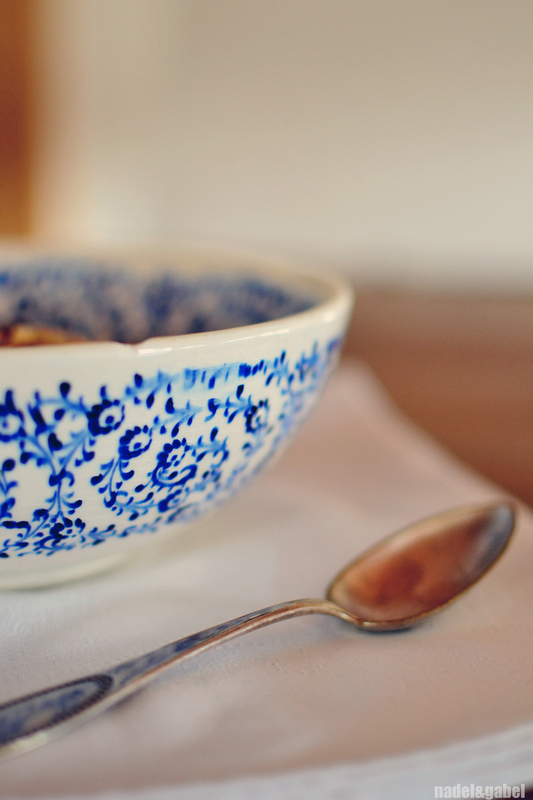 But: there’s no sugar in a Bircher Müsli – perhaps a bit of honey, maple or agave syrup, but that’s it. 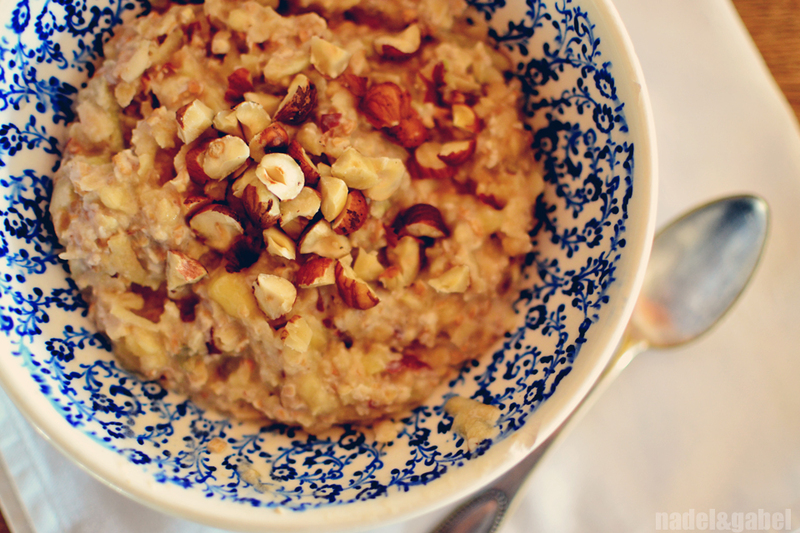 You can find more interesting Bircher Müsli variations on tucker. In a small bowl soak oats overnight with about 6 tablespoons of water (preferably sparkling mineral water). The next morning grate apple, mash banana with a fork and add both to the müsli. Add cinnamon and grated lemon zest. Mix with yogurt. 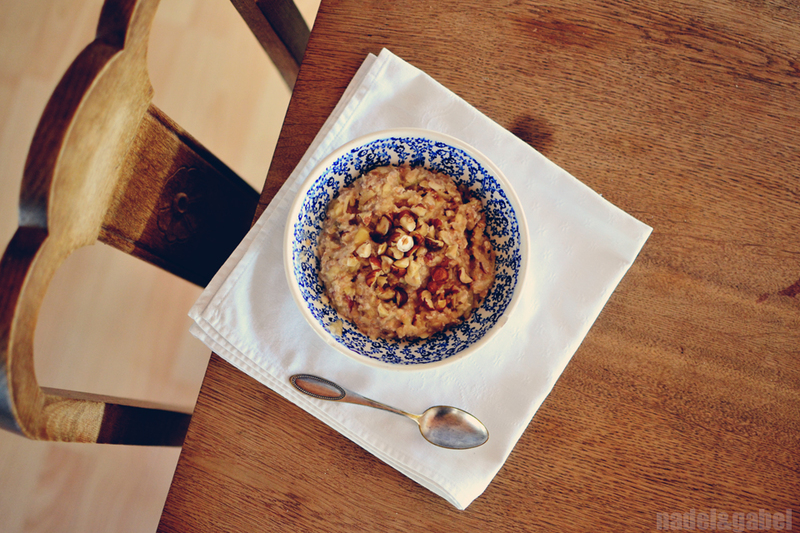 Top with toasted hazelnuts. This was such an interesting read, thanks! Your photographs are beautiful.